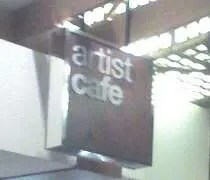 Artist Cafe at the Caesar's Windsor. I can only take so much gambling. J and I did pretty well. She came out a little bit ahead and I only lost the $25 I started with, but we were able to play for two to three hours with that money. Yeah, we’re boring. Just penny and nickle slots. I wanted to make not a lot of money last for a while. My mom and aunt didn’t come out ahead either, but they got to play all day and experience Canada. My mom loved that she got an “extra five bucks.” To her, it’s not about coming out ahead, it’s about playing for a while and having fun. The extra five bucks gave her that many more spins. For the first time in pretty much ever, I went shopping both the day after Thanksgiving and the day after Christmas. The same is true for J. We only had a couple things to return, but we had some gift cards and wanted to get a few more Wii games and I needed to go to Carson’s (Younkers) to get a shirt for a family picture we have to take tomorrow. The closest mall to J’s parents that isn’t the Ford City Mall is Westfield’s Chicago Ridge. After taking care of things at Carson’s, we headed to the food court. I needed a Pepsi bad and the vending machines only sold Coke. I’ve been drinking a lot of Coke Zero lately, but I really needed a Pepsi. I still have those bad cravings every now and then. There was a Taco Bell in the food court and I knew they sold Pepsi, so that’s where I headed, but we got sidetracked when J and her mom noticed a new place open where the customer service kiosk used to be. Melt Gelato & Crepe Cafe is a fairly new chain concept founded in 2006. They have shops in seven states with the most locations being in California. 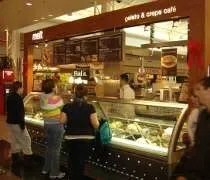 This particular location at the Chicago Ridge Mall sits near the entrance at the food court. It’s a stand alone kiosk sort of in the middle of the of the dining area.